Halifax First Aid features a number of different CPR and AED classes. 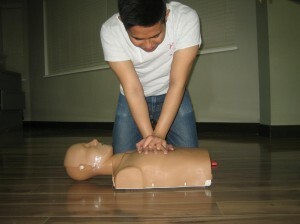 Essentially the simplest class presented via Halifax First Aid is cardiopulmonary resuscitation “A”. This training course takes around four hrs to complete and educates participants on fundamental CPR techniques for saving adult patients. Nearly all individuals pass the lesson with no problem and promptly acquire a St Mark James cardiopulmonary resuscitation card. This valuable certificate complies with government standards for CPR and AED accreditation for school or employee specifications. Halifax First Aid provides CPR and AED programs several times during the week at the cheapest rates. To enroll for a cardiopulmonary resuscitation (CPR) level “A” and AED program in Halifax browse right down to the lower part of the page to find out available training course dates, times and locations. The span of a cardiopulmonary resuscitation “A” and AED course is 3 to four hours as mandated through by provincial and federal regulations. The fee for the program is — dollars. Students will be taught cardiopulmonary resuscitation (CPR) methods for adult victims. Individuals will understand about legalities related to cardiopulmonary resuscitation and ways to utilize an AED. This stand-alone CPR course includes minimal education in cardiovascular emergencies. Over 99 Percent of the individuals pass the class with no difficulties. Students that finish the training course will immediately be given a workplace approved CPR level “A” award which is valid for 3 years. Halifax First Aid offers personal cardiopulmonary resuscitation (CPR) “A” training courses where the workplace approved instructor can come to you. For more info about exclusive classes contact us thru telephone or electronic mail. Refresher programs are not available for cardiopulmonary resuscitation “A”. Candidates have to re-take the course to re-certify the certificate. To register for the CPR level “a” course simply choose the class location, time and date listed below and fill in the enrollment forms. In case you have questions or queries please feel free to call or email us. Sign-up into a CPR “A” and AED training course in Halifax today and study the essential CPR techniques in order to save a friend or family members life.